You are here: Home / Blog / You Can Run On Snowshoes! Did you know you can run in snowshoes, and that people all over the world are already doing it? Learn more and get started with snowshoe running in this informational piece from Super Volunteer Gabrielle Orsi. When most people think about snowshoeing, they picture hiking along in a winter wonderland. But did you know that there is a world of people running with snowshoes on, and even competing? The world of snowshoe running is growing on a global level, and with specialized running-oriented snowshoes you can jog or run or take part in a race right now! As a trail runner, I enjoy running on the snow with my Dion snowshoes, proudly made in Vermont. I've competed in snowshoe races ranging from 5 kilometers to about 20 miles in length. I've also served for 4 years on the United States Snowshoe Association's (USSA) Board of Directors as a regional representative for the West Coast. The USSA promotes snowshoe running and racing and collaborates with the World Snowshoe Federation to promote the sport globally. 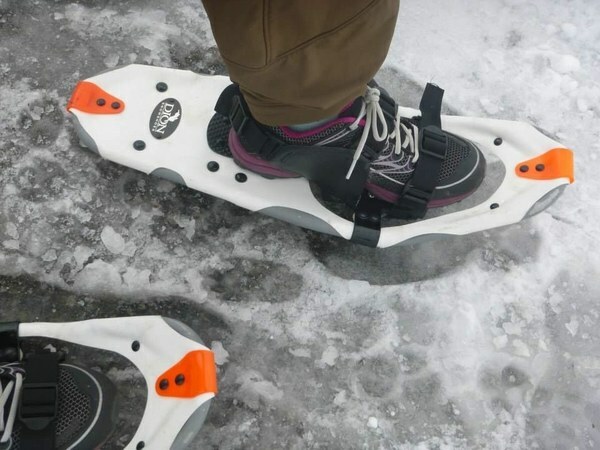 You really do need snowshoes specifically made for running. Snowshoes built for backcountry travel are too clumsy or large to run with! I have been very happy for more than 8 years with my Dion running snowshoes. Other major brands include Crescent Moon, Northern Lites, Atlas, TSL, Louis Garneau. Your pair of running snowshoes typically has one snowshoe meant for your right foot and one snowshoe meant for your left foot. I have marked my running snowshoes with some colorful electrical tape wrapped around the frame to identify them and to remind myself which snowshoe belongs with which foot. You don't need to greatly alter your stance or stride; instead do what feels natural and comfortable while running. Snowshoe running takes more effort than road running; it's more comparable to trail running than to road running. I suggest going by effort and time at first rather than actual pace or distance. Snowshoe running is best done on somewhat packed snow as most running-oriented snowshoes don't have a lot of flotation due to their trimmer silhouettes and less-aggressive cleats. Snow-covered back roads, the edges of Nordic ski trails, or already-broken snow-covered trails where the snow is not firmly packed down are ideal. Truly deep snow, where no one has yet blazed a trail, will slow you down to a walk! If all you need is traction - for icy surfaces or very hard-packed snow - and you really don't need to "float" over the snow at all, consider micro-spikes which provide excellent traction for running or hiking. Kahtoola makes popular models of micro-spikes. I wear trail running shoes for snowshoe running, and I wear wool socks for shorter snowshoe runs. 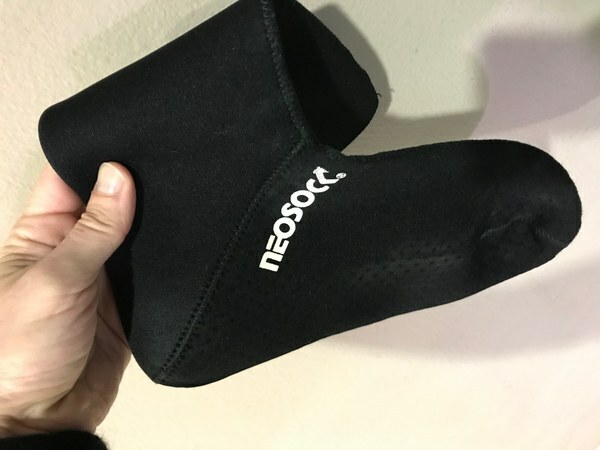 Even though my feet do get wet, the wool socks keep my feet warm enough, and I add on neoprene socks for longer distances or runs where I anticipate plowing through a lot of snow. I personally use the Seirus neoprene sock. My feet may still be damp with neoprene socks, but they stay very warm! Waterproof or Goretex trail running shoes aren't truly necessary, especially if you have a good sock setup. Wear gaiters and hard-shell pants or water-resistant pants, possibly over a light base layer; you'll kick up snow and splatter the backs of your legs while snowshoe running. Always wear layers on your torso so that you can shed layers as you warm up. Lightweight gloves, sunglasses, hat or headband are good accessories. When the humidity level is higher or the temperature is closer to 32 degrees F., I tend to opt for polypropylene, or other wicking technical fabrics. When it is colder and drier outside, I opt for wool clothes (I have a number of merino wool base layer tops and bottoms in weights ranging from superfine to heavy). As wool will still be warm, but does get soggier, I am always trying to balance warmth and dryness. The Foothills branch trail running committee plans to host winter trail running courses and events, occasionally featuring snowshoes for running. The USSSA publishes a calendar of snowshoe races online and hosts an annual national championship race, rotating among different regions of the US. Here in the state of Washington, Krank Events puts on 2 snowshoe races; near Mount Hood in Oregon the White River snowshoe race is held each January. If you are interested in competing in a race, be sure to check the USSSA's list of permitted snowshoes.